James Wood is an advertising professional who helped pioneer social media at Bolt.com in the late 90s. Before working at mcgarrybowen, where he was instrumental in bringing me on board as a photographer for the Verizon campaign, he worked at entertainment companies including MTV, Syfy and Scholastic. He's currently Group Creative Director at MRY in New York. James always had great perspective about our project, ranging from broad, big-picture ideas on strategy down to creative direction and ideas for our individual shoots. I sat down with him to talk more about his perspective on great social campaigns. What do you see as the main challenge for brands who want to interact through social channels today? There are two key problems that brands face when they’re trying to create content in these channels. The first one is providing value. You’ve got to give somebody a reason to be a fan of your brand in the first place. I think all too often brands don’t really offer much other than throwing out some resized image assets from their other media channels. The other challenge is that when content starts showing up in your newsfeed it has to be something that you even remotely pay attention to. The Facebook newsfeed is a very fluid dynamic experience. You flip through your newsfeed the same way you flip through a magazine. So it’s sort of the age-old print medium problem of how do you get somebody to stop flipping through the magazine long enough to take in your advertising message. 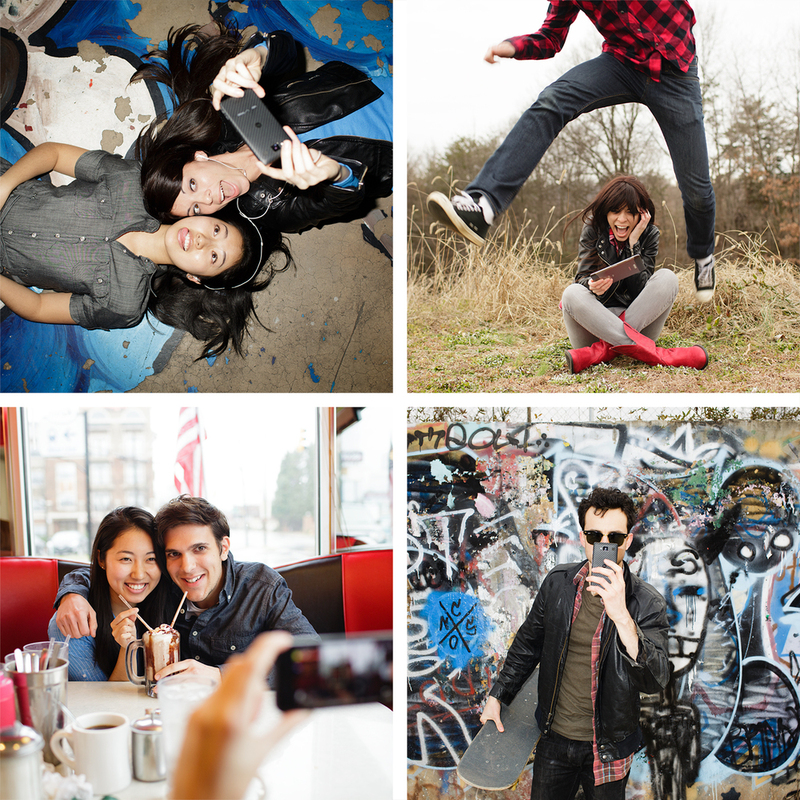 Verizon lifestyle work that I shot while James was creative director for the campaign. I think part of what brands struggle with is they take these things that are mocked up comps that totally feel organic to the advertising world. They feel right as a banner ad or a TV spot or whatever. Then they stick it into a place where quite frankly it just don’t belong. It feels alien to the medium. So a brand has to say: okay if we’re not just going to repurpose the advertising assets we already have, how do we cost-effectively create something else? They turn to stock photography. Like anything else obviously there’s some stock that’s really great and there’s some stock that’s really awful. I do think you can approximate something that feels genuine and organic through stock, but you’re obviously left limited to what you can find that feels right. We experimented before your arrival with just shooting stuff with phones. I felt that we were able to capture the moments that we were after, but certainly never were able to do it in a way that had the stopping power that we wanted to have. I certainly hope it continues to be a big part of what agencies can offer and what brands would be interested in buying. Relevant content is going to be more and more important in the years to come as people’s consumption habits get more and more fractured. Figuring out how to get the tenants of a brand into content is always going to be a valuable service. I think we chose to do it in a smart way as far as the Facebook newsfeed goes, but there are any number of apertures moving forward that you’re going to have to try to create the same success with. One thing that I’ve felt is a challenge for this kind of work, is that an audience is much quicker to cry foul or to call out a brand for a misstep. For many brands it’s become so evident that people are just waiting for brands to screw up social media. They’re just waiting for that errant tweet to go out that says something insensitive, or for a brand to post something that maybe they didn’t realize was inappropriate for this reason or another reason. I think that created unfortunately a culture where they are just terrified of putting anything out there that hasn’t been completely vetted and legally chopped up and down. Like, “There’s no way this is going to be a PR disaster for us.” It really cuts down on the amount of stuff you’re able to do that feels reactive in real-time. When we get to authenticity for the platform, timeliness is a big part of that too. There’s nothing you want to skip over in your timeline faster than something that feels like it’s from last week. You know what I mean? You tend to stop on the things that feel like they’re happening now. Very rarely are you stopping on the photo from your friend who did something very cool last Tuesday. They’re at the bar now and you kind of want to live vicariously through the fact that they’re doing whatever it is they are now. NFL shoot with Clay Matthews that I did while James was overseeing the Verizon campaign. Looking at all the platforms for brands out there: One interesting thing to me is the rise in prominence of Instagram. And in particular, that on Facebook, anyone can simply pay for followers and engagement. You can pay Facebook and amplify something, and no matter how horrible the content is if you pay enough money you can get in front of lots of eyeballs. Instagram is changing in terms of being an advertising platform, but it seems like they’ve been very protective. I very rarely see promoted posts and I think they’re being very careful to work with companies who are creating great content. That could change down the line. But as it is right now, much more than on Facebook a successful feed on Instagram has to be based on good content because no one is going to follow your brand for any other reason. I think you’re right. Zuckerberg wanted to keep Facebook “pure” for the longest time and he tried to really keep advertising out. Quite frankly it’s made our job difficult because we haven’t been able to do lots of the things that make sense for our clients, but obviously don’t make sense for consumers. It’s good in a way, but there’s going to be that curve always, like yeah Instagram is pure for a while but sooner or later everybody wants to make the billions of dollars that Facebook eventually made. I think Zuckerberg is at the point where I don’t think he’s selling out necessarily but he’s definitely making it far more advertiser-friendly than it was even a couple of years ago. That’s why I think you’ll see something else emerge that we haven’t even heard of yet but everybody will sort of go find refuge in it for a while until that becomes big enough that advertisers start paying attention to it. It’ll be a cyclical process I’m sure forever. Do you think that there’s a tendency for advertisers in the digital and social media space to be too focused on analytics and not enough on the actual content? There’s that brilliant video about the fake company that provides clicks. Basically they’re saying: what is the point in even measuring things by clicks or views or whatever when it’s always a fake number? What happened to judging things by whether it was truly entertaining and well-crafted and a great story and saying something poignant about the product or the brand or the consumer behavior? I feel like the work at the end of the day should always make people like the brand, make people want the products, make people want to have relationship with that brand for the foreseeable future. Those things are all measurable but very rarely are those things measured by views and click-throughs. I don’t know, in many ways it’s still a very infant space and it’s exciting but you can also see the places that we’ve already run off the road a little bit. 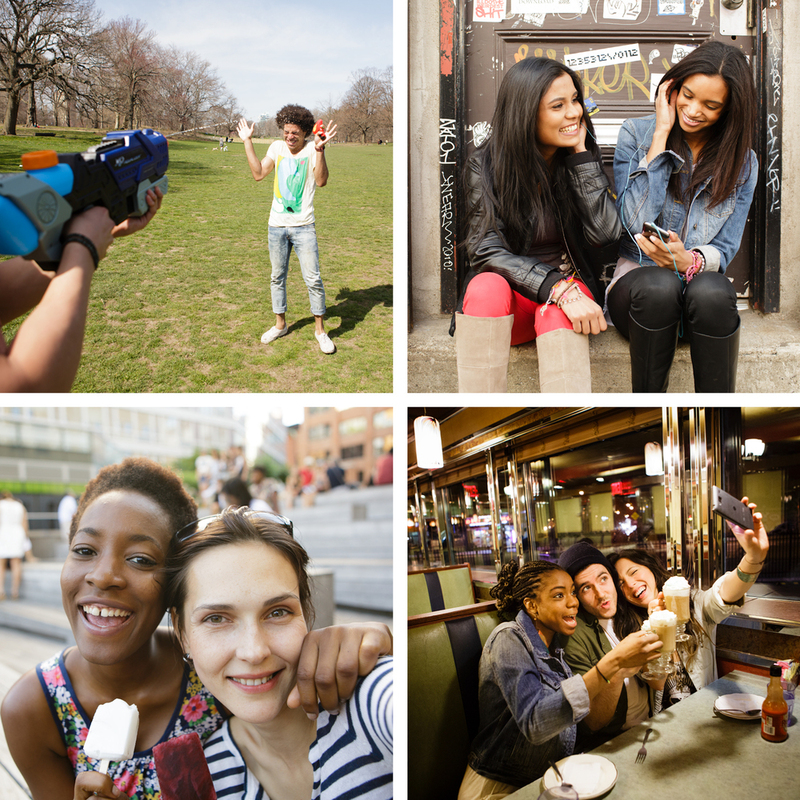 A variety of work that I shot for Verizon while James was creative director of the campaign. What do you think you’ll take away from the social project that we worked on together? I don’t know, it’s thrilling that we succeeded in terms of what we set out to do. It’s thrilling to know that there are lots of things we could have done differently and better. It’s a process and at the end of the day so long as you’re always trying to provide something valuable to the consumer, you’re not going to get it too wrong.